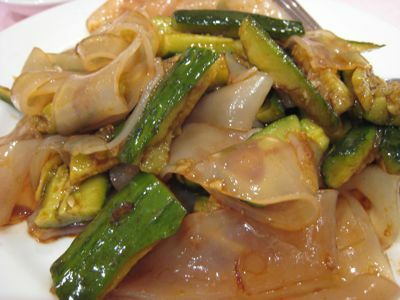 First up was an appetizer type dish of cold green bean sheets or noodles, with garlic and cucumbers and served with a hot mustard on the side. This was superb. Cold, elastic, clean, bracing, with a hint of soy possibly, or just good vinegar. Yum. It could have been that we were hungry, but I think I could have eated a whole order of this dish by myself. 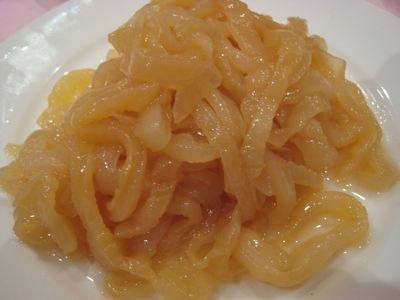 Next, a plate of jellyfish. Great texture, but I have always found them relatively tasteless unless one adds soy or other seasonings. I must say, these were plump, pliable and as good as jellyfish gets for me. Next up, pritong isda. Or so I thought with some amusement when it arrived. It looked like a fried lapu-lapu or something. But it wasn’t… I think the fish is called a “yellow croaker” in Chinese and I am not sure if it is freshwater or saltwater, but the flesh was incredibly white, light and delicious! And yes, the deep frying treatment was perfect. This fish and a side dish of vinegar and rice alone would also have made me a very happy camper, indeed. The Kid is a huge duck fan, so we had a platter of roasted duck (saving Peking Duck for the last night) that was well executed and flavorful. 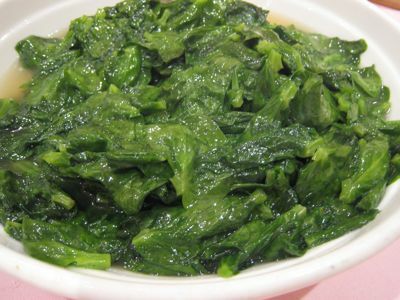 Some “Dow Mui” or the tops of pea shoots quickly sauteed. These were gentle on the tongue with a mild flavor that was yummy. And a final dish of sliced noodles with veggies. It was a very nice and seriously filling meal. The restaurant is in the basement of the building, not fancy at all, but with delicious food. Total bill for this meal that could have fed 8 people, but we were only 5, was roughly USD150, a great deal by HK standards. We could barely walk out of the restaurant to hail a cab back to our hotel! Pea shoots are a gorgeous vegetable, quickly sauteed with garlic and eaten with a perfectly steamed bowl of rice is one of my favorite winter meals in China. Pity you didn’t get to try the crabs, they are less meaty, but it’s the season, some folks even reserve their share months ahead. I like them cooked simply, then dipped into the black vinegar and ginger. You’re the second person/pov that mentioned being surprised about the variety of flavors in chinese food. I think all the years of bad chinese takeout have destroyed a mother cuisine’s reputation. Everything look so delish..homey type of dishes, yet really sought after. Speaking of the yellow croaker, funny, but its one of the cheaper fish here in Texas, and yet one of the best tasty, and good meat fish. It is fresh water fish. A lot of not so professional fisherman in fact always get a catch of those in nearby dikes and streams. Sometimes even in man-made lake from big residential subdivision. Smaller variety of this fish is used as a bait to catch salt-water fish. I love them fried with atchara. I also loved the green bean sheets noodles, pan-fried with chinese brocolli and hoisin sauce.. yummy. when you get to “full tank” danger zone I just say … eat faster! I’ll be heading over to Hong Kong after the New Year to do a bit of job scouting, have some fun (I love the lifestyle for young expats), and hopefully try some good local cuisine. Wow, I can not wait to be there next year to taste the food. as i eat my ‘baon’ of pork adobo and rice, i’m looking at your absolutely beautiful photos, and i can almost taste those dishes , especially that soup… mmm yummo! quite agree with you with regards to the different cuisines of China. 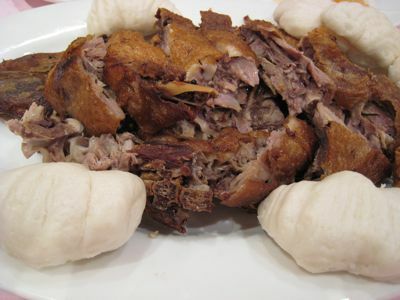 Chinese regional cuisines are so unique and different from each other. The contrast in flavours and textures, and the different ways the ingredients are approached and used, translates to endless possibilities and simply food heaven. I too am a fan of food from that region, when in HK my family goes to Wu Kong Alpha House Basement Peking Rd. cor Nathan rd. TST in the kowloon side. I also agree that food biases are as varied as snowflakes, But I must say, Hairy Crabs are probably my most favorite crustacean. food wise, this is what I look forward to the most during the ber months. For me the meat is not what its about, I agree with your hosts that our local crab’s meat has better flavor and texture BUT OH THE FAT! The richness of the experience is someting else. The sauce, a vinegar ginger and brown sugar concoction hightens and brings out the flavor even more. Its a little messy to eat but for me well worth the trouble. I would even recommend just buying some and having it at home. I belive some restaurants in manila serve it during the season. unfortunately the season os almost gone. The dishes look sumptuous, but I would have to prefer more Szechuan-style since I like my Chinese food spicy.. 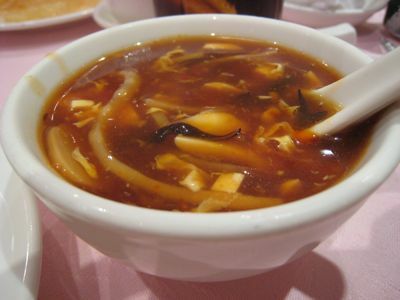 The picture of the hot and sour soup has me salivating.. Looks so delicious.. 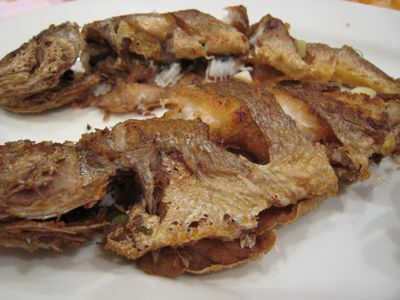 The yellow croaker croaked!…and ended up on your plate. Is it a cross between a cowardly fish and a frog? 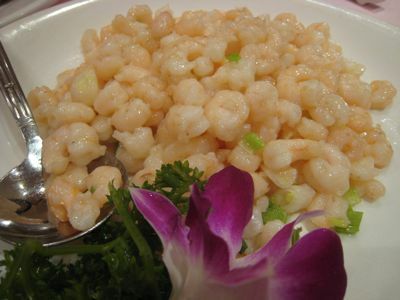 Of all the chinese regional cuisines, I am partial to Hakka dishes. Packed with flavor! The Dow mui looks gorgeous! That and a bowl of rice and I am set. Am spending the holidays there and this post just made me more excited for my trip. 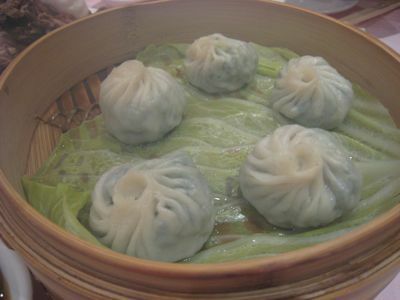 I love Shanghainese food and my HK shanghai resto in Hong Kong is Snow Garden in Causeway Bay (the other branches pale in comparison) Personal favorites are the noodles with cucumber in peanut sauce, the shrimps like yours, dan dan mien, the xiao long bao stuffed with crab fat, and when in season.. you must try this.. the lion’s head meatballs, which is a slow cooked braised pork meat ball and green leaf vegetable with shanghai crab and crab fat! Oh my gosh! The lion’s head is great without the crab but with it and the crab fat, its the absolute best! Booey, look up Zuma in the Landmark for a hip Japanese restaurant many people prefer it to the Nobu in Hong Kong. Its the hong kong satellite of a famous london japanese restaurant. Am trying it at the end of the month so I can’t say which one I personally prefer yet. Not surprisingly, although I just had my breaksfast, I’m again hungry when I saw the pics. I don’t think I’ll ever have the willpower to diet if I keep on going to Mr MM’s site. Haha! Thanks for the Zuma and Snow Garden tip. Will be staying at the Causeway Bay area so will try that. Happy holidays! Hi MM! Pea shoots are yummy, aren’t they? 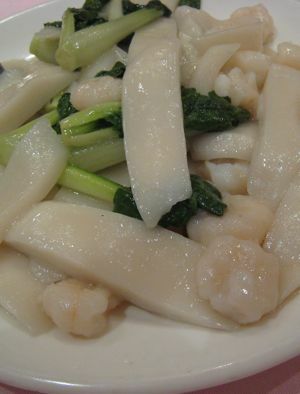 Simply sauteed with some garlic they round out a meal with a meat dish or two amd steamed rice. 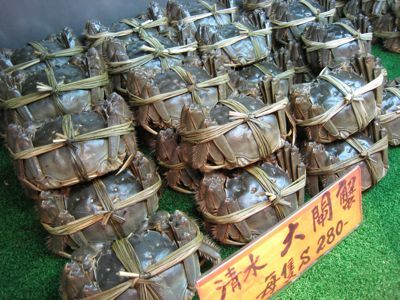 Hairy crabs are not meaty or particularly sweet, but the roe is quite good, and attached to the roe is a gooey, stickly, greyish thing that is absolutely delish! :) It is expensive in restos, so my friends and I bought some from a local purveyor for 100 HKD each, steamed them ourselves, ate them with rice and pea shoots, and some fried meatballs “bola-bola” with water chestnuts (a good addition, I might add), then finished off with ginger tea. Everything looks good but the newcomer to me is the pea shoots. Never have had that before looks very inviting though. Hi MM! I’d love to take you, Mrs MM and the Kid out for a food-fest when and if you do come to Shanghai. I think you’d like a lot of the ethnic Chinese restaurants here. While I love our Crabs the hairy crab packs a lot of umami or linamnam. Yeah!!!!! Thank you thank you for the tip….another great Shanghainese place to try in Hongkong…next to premium taba ng talangka, the flavor of the glutinous white fat of the male hairy crab has to be the ultimate in the “malinamnam” department of flavors …the river shrimps look absolutely divine!!!! Marketman’s Quick Tip #4 — Keeping Your Pesto Bright Green!